Books — Connie Stapleton, Ph.D. If you know that food/weight have caused problems in your life and you have wanted to get and keep your extra weight off, but cannot seem to do so...you may be a food addict. Have you lost weight with the aid of bariatric surgery, a medically supervised weight loss program, or fad diet, but ended up regaining at least all that you lost? Food addiction may be a reason! Food addiction is often undiagnosed and can sabotage even the best efforts to lose weight and keep it off. Food addiction is a disease separate from the disease of obesity. If food addiction is present and untreated, it will overtake efforts to treat the obesity, resulting in ongoing medical comorbidities, hopelessness, and frustration. Learn about how food addiction may be interfering with your weight loss efforts. Discover how to treat the addiction so that weight loss efforts are successful. Learn to live healthier, happier, fuller lives! Your Health. Your Responsibility. This Day. Every Day. Eat it Up! is the first book incorporating a whole person, mind/body/spirit approach to prevent weight regain in the months and years following weight loss surgery. Each chapter is devoted to a “Center of Balance,” explaining obesity’s negative impact on every aspect of a person’s life. Eat It Up! offers skills and strategies to overcome difficulties following weight loss surgery, resulting in the reward of lifelong happiness and healthy living, free from weight regain. Written with humor, compassion and a “firm and fair” approach, Eat it Up! is a must-have for the millions who are obese or overweight. Regaining weight in the months and years following bariatric surgery is a devastating reality — one that can be prevented. Take Dr. Stapleton with you in your car as you commute and on trips, or while you exercise. Order the audio of her book, narrated by Dr. Stapleton, available today on CD. "Eat It Up! is a must-have book for surgical weight loss patients. 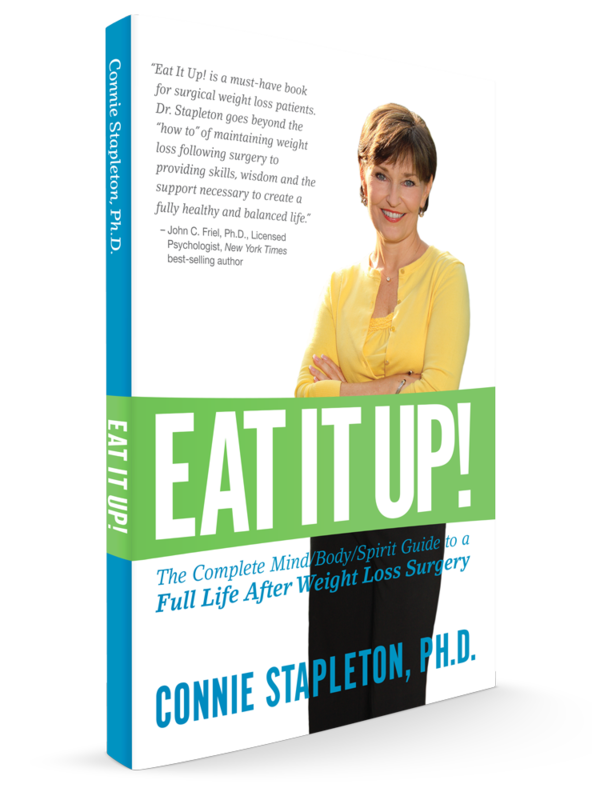 Dr. Stapleton goes beyond the "how to" of maintaining weight loss following surgery to providing skills, wisdom and the support necessary to create a fully healthy and balanced life." All of the exercises in Eat It Up! The Workbook are created to help you focus on your overall health and well-being, while maintaining a healthy weight for the rest of your life. Be the example to the others in your life and invite them to join you in your Recovery From Obesity! The first book of its kind, Thriving! combines weight loss information with moving stories of real-life WLS patients who share their life-long struggles and triumphs. It is possible to overcome childhood traumas and other factors that contribute to obesity and reclaim both health and happiness—and keep the weight off. Thriving! makes it clear that weight loss is about more than eating right, exercising and surgery. It will guide you in your quest to live fully, as the person you were meant to be. Find out how you can do so much more, and thrive, not merely survive.